In mammals, the lungs flank the heart in the chest cavity. The lung is either of the two primary respiratory organs in air-breathing vertebrates. Its principal function is to transport oxygen from the atmosphere into the bloodstream and to excrete carbon dioxide from the bloodstream into the atmosphere. This exchange of gases is essential for life: oxygen powers the production of chemical energy (in the form of ATP) via aerobic respiration, while the carbon dioxide by-product is toxic at high concentrations and must be removed from the system. 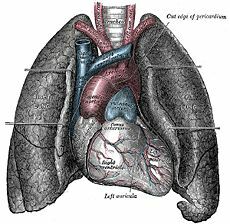 In addition to respiratory functions, lungs also play important non-respiratory roles, including serving as a physical layer of soft, shock-absorbent protection for the heart; removing fat from the bloodstream and storing it; storing and metabolizing glycogen; and filtering out small blood clots formed in veins. Overall, the lung reflects not only the principles of give and receive (the movement of gases between the organism and the environment), but also the interconnectedness of the parts of the body. The lung provides a function directed toward the preservation and development of the entire body; in turn, the body as a whole, and its parts, provides for the betterment of the lung, including supplying nutrients, removal of wastes from the cells, and so forth. The evolution of lungs played a crucial role in the development of complex organisms. In single-celled bacteria, gas exchange can take place entirely by simple diffusion. In larger organisms, however, only a small proportion of cells are close enough to the surface for oxygen from the atmosphere to enter through diffusion. Thus, two major adaptations made it possible for organisms to attain great multicellularity: an efficient circulatory system that conveyed gases to and from the deepest tissues in the body, and a large, internalized respiratory system that centralized the task of obtaining oxygen from the atmosphere and bringing it into the body, whence it could rapidly be distributed to any part of the circulatory system. Most lungs have a complex, honeycombed structure designed to maximize the surface for gas exchange. In addition, lungs are spongy and moist, which prevents them from drying out but also makes the environment hospitable to the bacteria associated with many respiratory illnesses. Though certain basic features are shared, the anatomy of the lung and its respiratory mechanisms are adapted to the particular needs of the organism. Air enters through the trachea (commonly referred to as the windpipe) and subdivides into smaller airways called bronchi. In most air-breathing vertebrates, the bronchi further subdivide into finer pathways of branching airways, until they culminate in specialized cells that form millions of tiny, exceptionally thin-walled air sacs called alveoli, where gas exchange occurs. Air enters and leaves the lungs via a conduit of cartilaginous passageways called the bronchi and bronchioles. In this image, lung tissue has been dissected away to reveal the bronchioles. In birds, however, the bronchi do not have dead ends, so that air can flow completely throughout the lungs. In addition, the function of the lungs is complemented by air sacs, which allow for a unidirectional airflow that enables birds to pick up a greater concentration of oxygen from inhaled air. The anatomy of their respiratory system thus equips birds to fly at altitudes with low oxygen content and to sustain extremely high levels of activity for longer periods than possible for mammals. Among fish, lungfish have lungs, as well as gills. Air is brought into the animal via the airways; in reptiles, birds, and mammals, this pathway often consists of the nose, pharynx, larynx, trachea, and bronchi. The drawing and expulsion of air (called ventilation) is driven by muscular action. In early tetrapods, air was driven into the lungs by the pharyngeal muscles, whereas in reptiles, birds, and mammals, a more complicated musculoskeletal system is used. The lungs of mammals have a spongy texture and are honeycombed with epithelium (a thin layer of tightly packed cells), a structure that maximizes the surface area for gas exchange. A schematic depicting the bronchi, bronchial tree, and lungs. Mammalian lungs are located in two cavities on either side of the heart. Though similar in appearance, the two lungs are not identical. Both are separated into lobes, with three lobes on the right and two on the left. The lobes are further divided into lobules, hexagonal divisions that are the smallest subdivision visible to the naked eye. Two main bronchi (produced by the bifurcation of the trachea) enter the roots of the lungs. The bronchi continue to divide within the lung, and after multiple divisions, give rise to bronchioles. 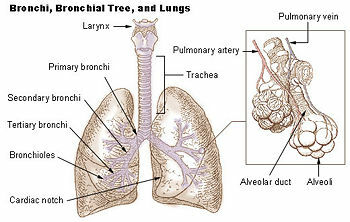 The bronchial tree continues branching until it reaches the level of terminal bronchioles, which lead to alveolar sacs. The latter are made up of clusters of alveoli, which resemble individual grapes within a bunch. Each alveolus is tightly wrapped in blood vessels, and it is here that gas exchange occurs. Deoxygenated blood from the heart is pumped through the pulmonary artery to the lungs, where oxygen diffuses into blood and is exchanged for carbon dioxide in the hemoglobin of the erythrocytes. The oxygen-rich blood returns to the heart via the pulmonary veins to be pumped back into systemic circulation. 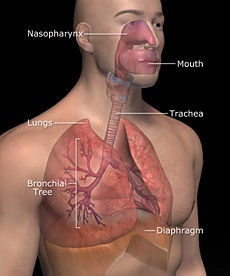 Breathing is largely driven by the muscular diaphragm at the bottom of the thorax. Contraction of the diaphragm pulls the bottom of the cavity in which the lung is enclosed downward. Air enters through the oral and nasal cavities; it flows through the larynx and into the trachea, which branches out into bronchi. Relaxation of the diaphragm has the opposite effect, passively recoiling during normal breathing. During exercise, the diaphragm contracts, forcing the air out more quickly and forcefully. The rib cage also is able to expand and contract to some degree, through the action of other respiratory and accessory respiratory muscles. As a result, air is sucked into or expelled out of the lungs, always moving down its pressure gradient. This type of lung is known as a bellows lung as it resembles a blacksmith's bellows. Because mammalian lungs culminate in dead ends (the alveolar sacs), the pathway of airflow is tidal (i.e., air comes in and flows out by the same route). In contrast to mammalian lungs, avian lungs do not contain alveoli; instead, they possess millions of tiny passages known as parabronchi. Air flows through the honeycombed walls of the parabronchi and into air capillaries, where oxygen and carbon dioxide are traded with cross-flowing blood capillaries by diffusion, a process of crosscurrent exchange. In addition to the lungs, birds possess two sets of air sacs, one towards the front, and a second towards the back. At the first inhalation, air travels backwards into the posterior (caudal) sac. A small portion travels forward past the parabronchi, oxygenating the blood into the anterior (cranial) air sac. During the first exhalation, this breath of air flows from the posterior sacs into the lungs, while deoxygenated air held in the cranial air sac is exhaled. During the next inhalation, the breath flows from the lungs to the anterior sacs. During the next exhalation, the breath of air is expelled. The complex system of air sacs ensures that the airflow through the avian lung always travels in the same direction—posterior to anterior—in contrast to the mammalian system of tidal airflow. By utilizing a unidirectional flow of air, avian lungs are able to extract a greater concentration of oxygen from inhaled air. Birds are thus equipped to fly at altitudes at which mammals would succumb to hypoxia (a condition in which tissues are deprived of an adequate supply of oxygen). Their respiratory system also allows them to sustain a higher metabolic rate than that of a mammal with an equivalent weight. Reptilian lungs are typically ventilated by a combination of expansion and contraction of the ribs via axial muscles and buccal pumping. Crocodilians, an order of reptiles that are the closest living relatives of birds, also rely on the hepatic piston method, in which the liver is pulled back by a muscle anchored to the pubic bone (part of the pelvis), which in turn pulls the bottom of the lungs backward, expanding them. The lungs of most frogs and other amphibians are simple balloon-like structures, with gas exchange limited to the outer surface area of the lung. Although it is not an efficient arrangement, amphibians have low metabolic demands and also frequently supplement their oxygen supply by diffusion across the moist outer skin of their bodies. The term "lung" is sometimes used to describe structures in some invertebrates that serve a similar respiratory purpose, but are not evolutionarily related to vertebrate lungs. Some arachnids use structures called book lungs for atmospheric gas exchange. The Coconut crab uses structures called branchiostegal lungs to breathe air and must hold its breath underwater. The Pulmonata are an order of snails and slugs that have developed structures resembling vertebrate lungs. Lungs serve as a physical layer of soft, shock-absorbent protection for the heart, which the lungs flank and nearly enclose. Water, alcohol, and drugs can be absorbed and excreted via the lungs. Fat in the bloodstream can be removed and stored in the alveolar cells. Lungs can store glycogen (the storage form of glucose) and metabolize it, aiding the liver in its regulation of blood glucose levels. Lungs can filter out small blood clots formed in veins. The lungs of today's terrestrial vertebrates and the gas bladders of modern fish have evolved from simple sacs (outpocketings) of the esophagus (part of the digestive tract); these outpocketings allowed the ancestral organism to gulp air under oxygen-poor conditions. Thus, the lungs of vertebrates are homologous to the gas bladders of fish (but not to their gills) (i.e., they signal descent from a common ancestor). Chesnutt, M. S., and T. J. Prendergast. 2005. Lung. Current Medical Diagnosis & Treatment 44: 215-307. Purves, W., D. Sadava, G. Orians, and C. Heller. 2004. Life: The Science of Biology, 7th edition. Sunderland, M.A. : Sinauer. ISBN 0716798565. Ritchison, G. 2007. Avian lungs and respiration.. Ornithology course page. Eastern Kentucky University. Retrieved July 19, 2007. Hopley, L. and J. van Schalkwyk. Lung Function Fundamentals. Johnson, D.R. Introductory anatomy, respiratory system University of Leeds. This page was last modified on 3 August 2018, at 21:50.